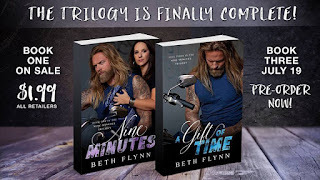 Ellie Is Uhm ... A Bookworm: Pre-Order Sale for A Gift of Time & $1.99 Sale Price of Nine Minutes by Beth Flynn! Pre-Order Sale for A Gift of Time & $1.99 Sale Price of Nine Minutes by Beth Flynn! A GIFT OF TIME is the HIGHLY ANTICIPATED conclusion to NINE MINUTES where Grizz, Kit & Grunt's gritty tale continues! You aren’t going to want to miss this! Pre-order your copy for a July 19th release. Haven't started this AMAZING series yet? Now is your chance, Nine Minutes (Book One) is NOW ON SALE for ONLY $1.99!